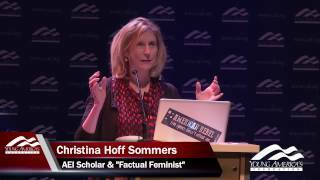 Christina Hoff Sommersis a resident scholar at the American Enterprise Institute. Before joining AEI she was a professor of philosophy at Clark University. Her articles have appeared in publications such as The Journal of Philosophy,The New England Journal of Medicine, The New York Times, and The Atlantic. Sommers is the editor of Vice and Virtue in Everyday Life, a textbook on moral philosophy. Her books include Who Stole Feminism and The War Against Boys (the latter was a New York Times “Notable Book of the Year”). She is co-author of One Nation Under Therapy. Her video blog:The Factual Feminist has attracted millions of views. She co-hosts a new podcast The Femsplainers.